One of the worst things about fall, besides everything, is that it’s clown hoax season. Without fail, as soon as the leaves start to drop from the trees, terrible people all over this country start dressing up like circus demons in order to scare kids and go mega-viral. Or, in the case of two people in Georgia, they merely pretend to have seen clowns kidnapping children, earning themselves zero lasting fame and some criminal charges. The LaGrange Daily News in Georgia reports that a man and his sister-in-law have been charged with making a false report for a fake clown sighting. Police say Brandon Moody, 26 and Rebecca Moody, 27, both separately called 911 and told dispatchers that people in “clown costumes” were trying to lure children into a white van. Responding officers did find people in a white van, who were sitting there because they’d run out of gas; a search of their vehicle revealed no children or clown paraphernalia, the Daily News reports. Editor’s note: The Daily News usually only identifies those charged with felonies, but due to the highly public nature of the recent “creepy clown” reports causing public unrest, we have identified the two charged with false reports in this story. Indeed, the clown-based public unrest is real, and not just in the presidential campaign. 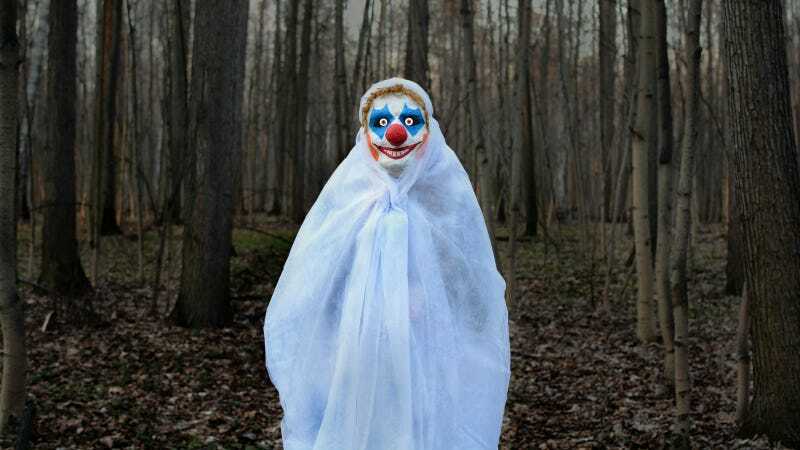 Earlier this month, there were purported creepy clown sightings in North and South Carolina, and one in Green Bay, Wisconsin in August that turned out to be a bad marketing ploy. There were also rumors circulating on Facebook that the clowns plan to drive to area schools and take children from their desks: Someone put up a Facebook page, since removed, threatening to drive to five elementary and middle schools to kidnap children. Police said they’re getting a warrant to track down the person who created the Facebook page. On September 14, they clarified that there is“no credible physical evidence that indicates that there are any clowns, driving in any white vehicle or van, in our city, attempting to commit crimes,” according to a lieutenant.